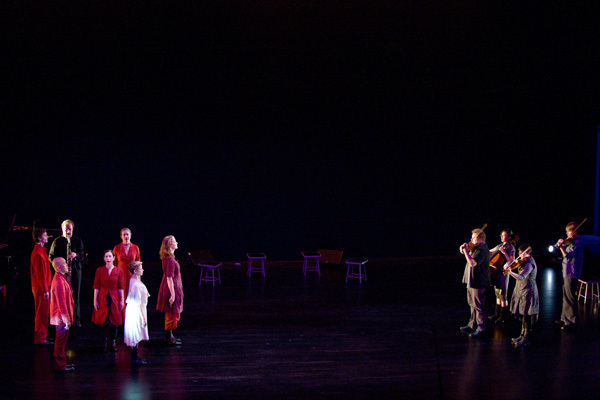 Meredith Monk and Ann Hamilton, Songs of Ascension, 2008. Photo: Walker Art Center. When artists such as Tino Sehgal, Meredith Monk, Danh Vo, Trisha Brown, or Merce Cunningham enter the Walker Art Center’s collections, some vexing issues arise when it comes to cataloguing their often ephemeral, multidisciplinary, and indiscrete works. On Nov. 4, presenters, curators, archivists, and researchers from around the country will come to the Walker and spend the day together talking about what it means to catalogue performance. We will revisit questions that have existed since the 60s but have become pressing of late: why do it, for whom is it done, what is captured and how, what is discarded and why, what is updated and when, and whose perspective is it… The workshop, led by Philip Bither, McGuire Senior Curator of Performing Arts, and Robin Dowden, Director of New Media Initiatives, will inform design and development for cataloguing the Walker’s 50-year history of performance art commissions. Abi Sebaly, Cunningham Fellow, catalogs the costumes Robert Rauschenberg designed for Merce Cunningham's Antic Meet (1958). Photo: Gene Pittman. In preparation for it, I’ve interviewed Coventry University professor Sarah Whatley about her experience cataloguing the contemporary performance practice of British choreographer Siobhan Davies. Whatley collaborated with Davies on the UK’s first digital dance archive, Siobhan Davies Replay, which at the moment entails over 500 moving images, nearly 2,000 still images, 300+ text files. Their team worked together for 30 months before the project launched online in 2009. We spent an hour or so talking about documenting and publishing information on living artists’ performance work. 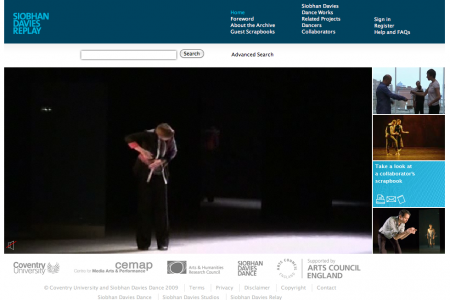 Homepage for Siobhan Davies Replay. Brooke Kellaway: The question of how much to involve the artists is definitely on my mind. It’s their work the catalogue is representing and we want their input—pragmatic and creative. At the same time, with hundreds of artists in the Walker’s collection, we’re trying to construct some sort of coherency and consistency in the catalogue entries. Were you really open to the project evolving in collaboration with Siobhan Davies, or did you from the start have a set structure in mind? Sarah Whatley: It was very much working in collaboration with the artist, from the beginning. And that was not without its challenges, as you can imagine. In a way, the artist is thinking—understandably and rightly so—about her representation through the online, which is very different from how they’re represented either through what is understood as being the past, and surely the live present if they’re still making work. But of course when you’re building something that has to be robust and stable as an online resource, in a way we had to manage quite carefully their engagement with the nuts and bolts of the backend—to try and get them focused on the more aesthetic frontend part of it. But that could be quite tricky. I think it’s about managing that collaboration so the artist feels really involved and has a real sense of ownership, but on the other hand not permitting them to have too much control. It’s not an easy balance, and we struggled with it—it was all really healthy, all those tensions are ultimately really productive, but there are tensions. Brooke Kellaway: In making these kinds of new web-based resources, what is your stance on selection in terms of publishing material also accessible elsewhere (such as early press reviews), or focusing more on material that’s otherwise quite difficult for researchers to access, or both? 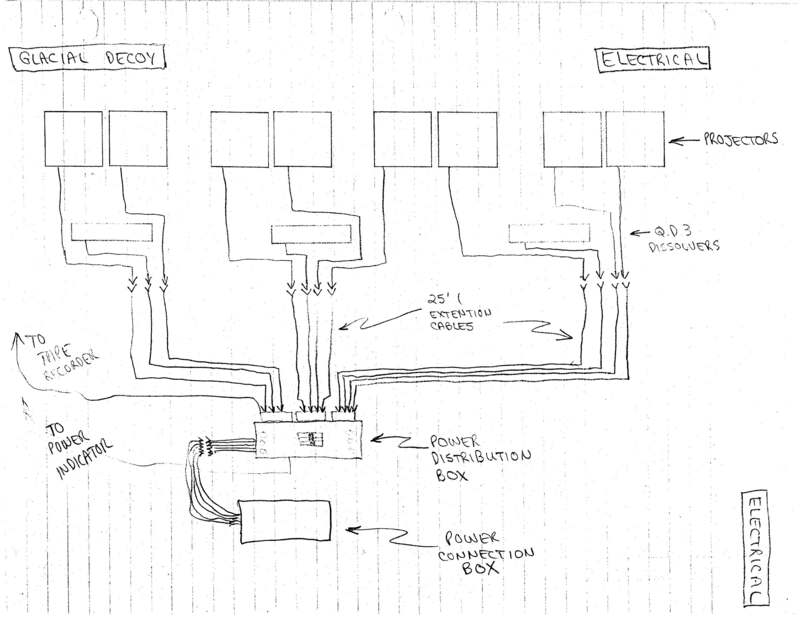 Electrical diagram for Trisha Brown Company’s Glacial Decoy (1979) at Walker Art Center, 1979. Credit: Walker Art Center. Sarah Whatley: This is a really important question. Of course the notion of an archive sort of suggests that it’s everything you can possibly get your hands on. And in a way I think the value of something which is archival in nature is in a way the user finds the meaning and connections so it doesn’t become overly curated or selected or edited in putting content up there. But there’s a pragmatic approach as well, which is to say, what can we really achieve in a timeframe that’s going to make this feel like a really full collection? Ultimately I think it comes down to what we can achieve. My advice from the experience we’ve had is to try to include as much as possible, because even if it’s already in the public domain, it won’t be in the same way in the public domain if it’s online because people are making connections that they wouldn’t make when they’re seeing a different copy. On the other hand, once you give people some content, then they’ll be intrigued to find out more content. So it’s a gateway to what else is available. The online means that you’ve got that wonderful environment in which you can put out a lot of stuff that otherwise would not be seen…it might never make it into the public any other way, such as rehearsal material and so on, and that seems to be really valuable from a user point of view, it’s information they really can’t get otherwise. Brooke Kellaway: Did Siobhan Davies maintain her own archive before you started this project? Did she organize a lot of her content in advance? One of the things that she’s absolutely brilliant about now as a Company, is that every time she does anything she gets sign off for everybody that’s involved in the performance. And this has been really important. Because her practice has shifted a bit, I mean she isn’t making work for theaters anymore, she’s making work in gallery spaces, she’s making installation work, and she’s working with major visual artists. She’s also now collecting like mad, collecting traces of the work, so, whereas some of the earlier works have got very little content—just a few videos, some photographs, and a bit of text—now she’s generating hundreds of images and hundreds of traces of her work, which is in itself quite demanding because we have to add the content. So essentially yes, the company collects everything and then we—the university—put it on the site. 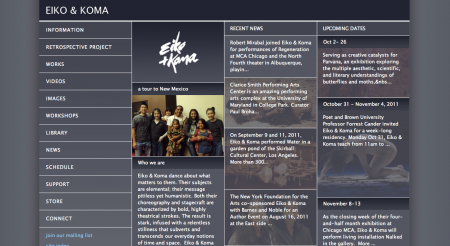 But, it’s an interesting question…I must just ask you about Eiko & Koma’s wonderful website that is sort of archival in a way. Brooke Kellaway: This is the perfect example. They’re so completely excited about the Walker presenting this history of their work with the Walker, and at the same time, they already have this beautiful and very rich archive of their own. I’ve been wondering how much our content should overlap—would we be using our resources most wisely if we present a certain amount of the same information? I’m not sure. Of course, as you mentioned earlier, users will make different connections based on the way the material is presented on the Walker’s site, vs. on Eiko & Koma’s site, and elsewhere, and our standards will differ, etc. Sarah Whatley: It could work very well – users who use yours may jump off onto their website and vice versa. I don’t think it as a problem of duplication, because in a way they are quite different things. When I was over in the States last year, Eiko & Koma came into a Network meeting that we were having and I was just fascinated by their discussion of Naked, and it’s presence on their site. It was very interesting how they bring their experiences as artists into that space. 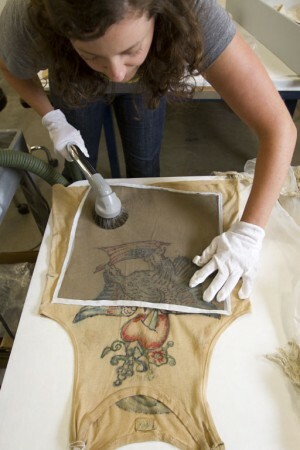 For example, of course the work is really slow and it takes a long long time to unfold. And they were saying things like, “We had to make it read online…there’s no point of having 17 minutes of doing nothing….” So they shrunk the screen and they changed the time span of the work, and that sort of thing, and they were of course coming at it from a choreographer’s perspective, they were thinking of it from a dance maker’s perspective, which is incredibly valuable. But when it’s their own content in their space, they can do that, they can be sort of playful. So I think it’s just about being careful about how those negotiations are carried through, because you will need to take ownership of what it is you’re doing but also respond to them as an artist thinking, “Well, actually our work reads very differently online.” So of course it’s about a healthy dialogue and a healthy negotiation, but it’s also I think from your point of view being very clear about what your purpose is and what you’re creating, and how does the artist come into that space of your creation, because it is your creative space in a way. Brooke Kellaway: Absolutely. And I think it’s so important to communicate that dialogue and that negotiation to the user so they come into the site and they really understand our impetus, and our process, and our relationship with Eiko & Koma. To either see it as a collaboration with the artist or not, or something in between. And that’s really important to convey to researchers. Sarah Whatley: Yes, to make the lens through which they’re meeting the work is extremely important. Brooke Kellaway: How have researchers responded to your project? Sarah Whatley: Generally really positive. I mean, inevitably, with something which is a bit pioneering in the sense certainly there’s very little else in the UK which is archival like this, of course they say, “Well now we want the same for all these other choreographers!” So it kind of sets the bar and all of that. But generally, I think one of the things researchers appreciate is the immediate, quick, one-click access to a lot of different material so they can make connections as I mentioned earlier, so they can see very quickly a span of work, they can see how work shifted and changed over time, so they can make quick connections between text-based material and visual material. And we‘ve got the scrapbook tool which is a really easy tool, which means the user can collect those searches and thoughts in a very easy and trackable way. Also, Davies is not really an artist who goes outside of the UK very much, but a lot of people across the world are now coming into her work, either because they’re intrigued about the archive as an archive or because they’ve found her material and then are seeing her work. So in a way it’s a new way of generating audiences. Brooke Kellaway: Do you keep it updated with new material that is found? Sarah Whatley: Yes we do, and that’s really challenging! Brooke Kellaway: How many people are working on this? Sarah Whatley: Well, theoretically nobody! No, I’m joking a certain part—because you get funding, and you build the thing, and you put it out in the world, and you kind of go “that’s it,” and of course it’s never “that’s it” because every time the artist makes something new it needs to go up. We want to keep the site fresh, so we do little tweaks with the color palette and things like that, and all of those kinds of things have real costs associated. The University in effect is still managing the updating. But it’s not easy, because again you’re managing an expectation of an artist who keeps making really different work. So of course she’s now saying, ‘”Oh but I want the archive to look different because I’m doing really different work,” and we’re saying, “But we can’t change the back end! The architecture for the archive is the architecture.” We can do some fairly low cost updates but we can’t do anything major. Brooke Kellaway: Will the project continue indefinitely? Sarah Whatley: We do have an agreement in place, which is 3 years, which we will then review, and see whether or not the partnership is productive and working for us. Inevitably funding is a big issue in that because it’s really hard to think in terms of how we continue to sustain the archive other than simply adding content. We’ve got licenses in place with a lot of our contributors and we’ll need to renegotiate those at some point, and all of those have costs involved, such as annual server costs, and all of those sorts of things. There are the staffing costs, and staff time. It’s a bit of a myth that once you build an archive it’s done and it’s finished. Of course the technology evolves as well, and already what we’ve started off with 3 years ago is already sort of ancient technology. Brooke Kellaway: What are your most important pieces of advice for the kind of project we’re doing? Sarah Whatley: Get as rich information as you possibly can from the artist—such as where exactly did this happen, who was in it—so that you can get as much knowledge about the performance. Because that in a way is what’s most useful for the user—they’re looking for extensive information, and the only people who can probably provide that are often the artists. That’s really important knowledge, it’s really critical knowledge. We thought we were going to be deluged with content, and actually we had to work quite hard to get information out of people. So at times you have content there but you might not have all the information about the content, so ask the artists as much as possible. And the other thing is to test it, get it out there and prototype, get users in to test it and to tell you what it is they find useful or difficult, and what’s there that they want more of and need. Interestingly, with Davies, she was really not that happy to test it before she felt like it was finished, complete. For us, it was really important to get it out when it was still really a bit scratchy and unfinished. We didn’t try to finish something before users told us what was working and wasn’t working. So go through a series of user testing, it’s really important because ultimately that’s your audience and your user community. Brooke Kellaway: Thanks so much Sarah. Sarah Whatley: It sounds very exciting. And I wish you the very very best of luck. If you’re interested in further reading on the topic of cataloguing/archiving performance, here’s a list of sources extracted from a larger bibliography I’ve been composing while working on the Walker’s new collection catalogue (to launch on collections.walker.org sometime next year). Allender, Paul, Ross Varney, and Sarah Whatley. “Digitizing Siobhan Davies’ Dance.” Body, Space & Technology, 7 (2) (2008): 1-13. Clarke, Paul. “Performing the Archive: the Future of the Past.” Draft of the talk by Paul Clarke for research project, Inside Movement Knowledge. October 31, 2009. Edmunds, Becky. “Creating Digital Documentation of Performance.” Video compilation of workshop for JISC Digital Documentation and Performance seminar, September 23-35, 2009, organized by JISC Digital Media and University of Bristol. Heydenreich, Gunnar. “Documentation of Change – Change of Documentation.” In Inside Installations, edited by Tatja Scholte and Glenn Wharton, 165-171. Amsterdam: Amsterdam University Press, 2011. **Heydenreich presented his paper in 2010 at the International Symposium Contemporary Art Who Cares? Hoffmann, Jens, Klaus Biesenbach, RoseLee Goldberg, Robert Wilson. Artistic Production | Collecting Performance. Recorded 11 June 2009, Art Basel, Basel, Switzerland. Hölling, Hanna. “On the Afterlife of Performance.” Essay for symposium, The Manifold (after) lives of Performance, November 13-15, 2009, coproduced by DeAppel and STUK Kunstencentrum. Inside Movement Knowledge: a two-year collaborative, interdisciplinary research project into new methods for the documentation, transmission and preservation of contemporary choreographic and dance knowledge. MAP (Media | Archive | Performance): a research project on media, art and performance. Mulready, Thomas. “Performance Art Festival+Archives.” Permanence Through Change: The Variable Media Approach, by Alain Depocas, et al. Solomon R. Guggenheim Museum and the Daniel Langlois Foundation for Art, Science, and Technology, 2003. Potts, Alex. “The Artwork, the Archive, and the Living Moment.” In What is Research in the Visual Arts?, edited by Michael Ann Holly and Marquard Smith, 119-137. Williamstown: Sterling and Francine Clark Institute, 2008. Siobhan Davies Replay: online archive of British choreographer, Siobhan Davies. The Cataloguing Performance workshop is supported by the Institute for Museum and Library Sciences’ grant-funded project, “CollectionSpace: Cultivating Shared Software Solutions Among Communities of Practice.” Attendees by invite only. Please check back mid-November for outcomes of the event.